Presonil Tablet: Each tablet contains Metoprolol tartrate BP 50 mg.
Metoprolol tartrate BP, is a selective �1- adrenoreceptor blocking agent. Metoprolol tartrate is (�)-1- (isopropylamino)-3-[p-(2-methoxyethyl)phenoxy]-2-propanol L-(+)-tartrate (2:1) salt. It is a white, practically odorless, crystalline powder with a molecular weight of 684.82. It is very soluble in water;freely soluble in methylene chloride, in chloroform, and in alcohol, slightly soluble in acetone; and insoluble in ether. Angina Pectoris: 50-100mg 2-3 times daily. Myocardial Infarction: After early intravenous treatment for 48 hours, patients should receive a maintenance dose of 100mg twice daily. Arrhythmias: usually 50mg 2-3 times daily; up to 300mg daily in divided doses if necessary. Migraine Prophylaxis: 100-200mg daily in divided doses. Bradycardia, Heart failure, hypotension, Conduction disorder, Bronchospasm, Peripheral vasoconstriction, Gastrointestinal disturbances, Fatigue, Sleep disturbance, Rare reports of rashes and dry eyes, Sexual dysfunction, and Exacerbation of psoriasis. Gereral: Metoprolol should be used with caution in patients with impaired hepatic function. patient's response to therapy with Metoprolol has been determined. contact the physician if any difficulty in breathing occurs. inform the physician or dentist before any type of surgery that he or she is taking Metoprolol. Pregnancy category C. There are no adequate and well-controlled studies in pregnant women. This drug should be used during pregnancy only if clearly needed. 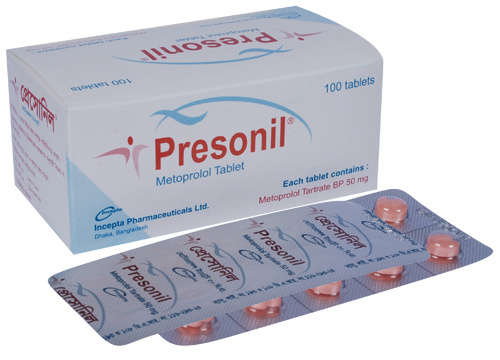 Metoprolol is excreted in breast milk in a very small quantity. An infant consuming 1 liter of breast milk daily would receive a dose of less than 1mg of the drug. Caution should be exercised when Metoprolol is administered to a nursing woman.